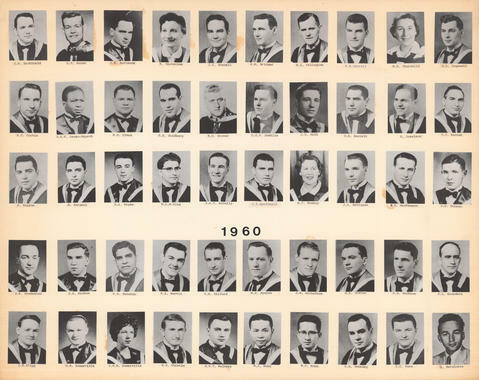 File is a composite photograph the Dalhousie Faculty of Medicine Class of 1960. Photograph includes 50 individual portraits with three photographs of Dalhousie Buildings. Composite photograph includes portraits: From top left: D.W. Archibald; H.M. Bacon; J.W. Barteaux; R. Bistevins; J.C. Bonnell; S.M. Bridger; R.L. Callaghan; N.N. Carroll; M.E. Churchill; D.L. Cogswell; A.C. Curtis; J.E.K. Danso-Dapaah; M.D. Elman; E.H. Goldberg; B.D. Grover; D.G.P. Hawkins; J.D. Hill; O.H. Horrelt; G. Joselson; Y.C. Kanter; S. Kaplow; G. Karpati; S.A. Keyes; W.L.M. King; J.A.Y. McCully, C.S. MacDonald; M.C. MacKay; J.J. McKiggan; B.L. MacKinnon; J.D. McLean; D.R. MacMaster; E.E. MacRae; R.N. Mahabir; R.L. Martin; D.M. Milford; W.G. Moores; D.M. NIcholson; D.R. Patton; G.B. Peckham; J.L. Saunders; L.B. Slipp; G.M. Somerville; J.H.M. Somerville; H.G. Thistle; B.H.V. Walters; W.L. Wong; W.T. Wong; R.H. Yabsley; J.C. Yarn; A. Matulonis.